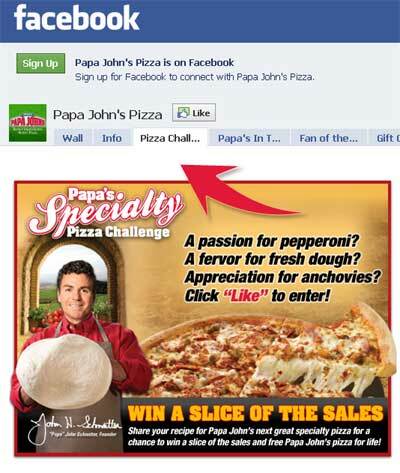 Papa John’s has launched a social media campaign on its Facebook page, called "Papa’s Specialty Pizza Challenge," asking customers to create and name its next specialty pizza. Whatever the name and combination of ingredients, Papa John’s is offering the contest winner a "slice" of the sales in return for the winning recipe. All entries will be featured in a gallery on Papa John’s Facebook page, where founder John Schnatter and his team will select ten semi-finalists. Those ten recipes will be tested at the company’s headquarters in Louisville, Ky. The challenge will then be narrowed down to the top three recipes, which will be featured temporarily on Papa John’s menu (August2-August 29), with the winner being the highest selling pizza. Papa John’s is offering the top three finalists a marketing budget of $1,000 to help drive sales of their respective pizzas. The grand prize winner will also receive free Papa John’s pizza for life as well as a chance to appear in a "Papa’s in the House" TV commercial.